Quickly add products to your shopping cart from anywhere on the site with the new Add By SKU feature. Prominently and conveniently placed in the header, this could be a timesaver for you when replenishing your sunglasses inventory. Just type or paste a product SKU (at least two characters) to bring up a matching list for selection. Pick one and you will see the stock available for purchase right next to the product. Single or multiple products can be added at once and the shopping cart will be quickly updated for review. 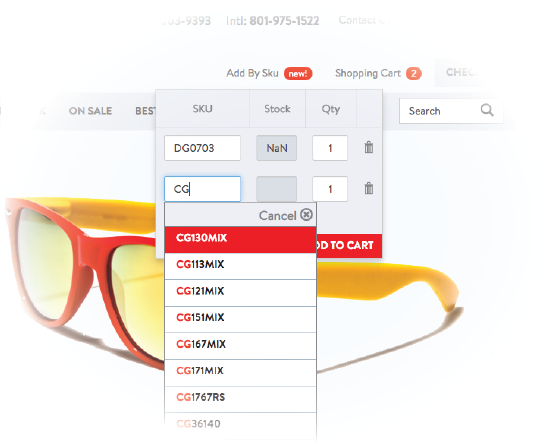 Add By SKU is just another way we've made buying from Olympic Eyewear easy and efficient.